Lian Li shows off the PC-A79, a new aluminium full tower case for Micro-ATX, ATX, XL-ATX, E-ATX and HPTX motherboards. The case features a removable motherboard tray and has room for up to nine 3.5" HDDs and two 2.5" HDDs. There's space for a 240mm radiator and up to eight 120mm fans. The PC-A79 measures 230mm x 618mm x 596mm (W x H x D) and weighs 9.9kg. Availability is slated for early September and the MSRP is $389. 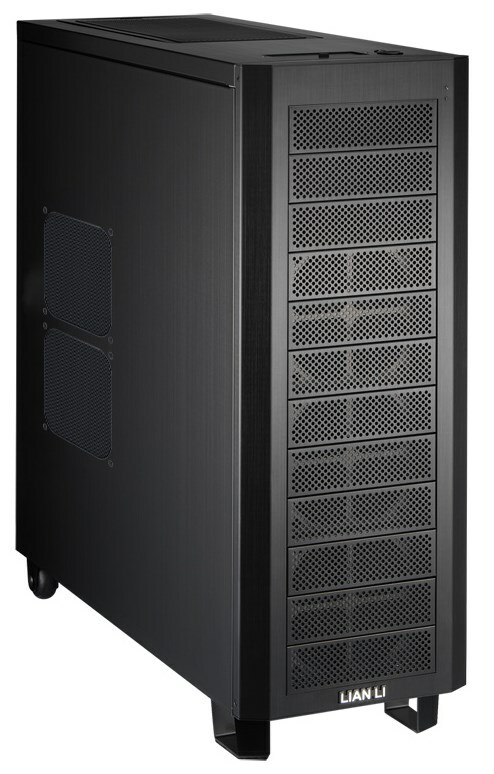 Lian-Li Industrial Co. Ltd today announces the release of a new brushed aluminum full tower chassis with a versatile cooling design and removable motherboard tray – PC-A79 – in North America. Capable of supporting HPTX, E-ATX, XL-ATX, ATX, and Micro-ATX motherboards, this fully aluminum full tower easily contains the latest high-end components, while keeping these components at optimal operating temperatures with its versatile and effective cooling design. The PC-A79 gives DIY builders several cooling options for a variety of system setups. For the front intake, the three HDD cages have 120mm fans mounted to them. These cages can be set up so that the fans are either towards the front of the case or behind the cage. A dust filter on each on the individual 5.25” front bezels prevents dust from coming in, no matter the setup. For those looking to install closed loop liquid cooling systems, the PC-A79 is a tool-lessly removable panel that allows 240mm radiators to be easily installed. On the side panel there are two 120mm fans for additional cooling that automatically shutoff when the side panel is removed. There is also a 120mm exhaust fan in the rear pulling out the hot air. The removable motherboard tray gives unhampered freedom to builders when setting up their system. The motherboard tray also features large cutouts for the CPU and rubber grommets for neat cable management. The large dimensions (W 230 x H 618 x D 596mm) (9.0” x 24.3” x 23.4”) of the PC-A79 translates to unrestricted component installation compatibilities and possibilities. Up to nine 3.5” drives and eight 2.5” drives can be tool-lessly mounted in this brushed aluminum full tower. Multiple graphics cards up to 350mm in length (13.7”) can be installed thanks to the 11 expansion slots, and CPU coolers up to 145mm in height (5.7”) are supported. Additionally, with the cavernous space inside the PC-A79, enthusiasts will not have to worry about not having enough room to build a high end system. 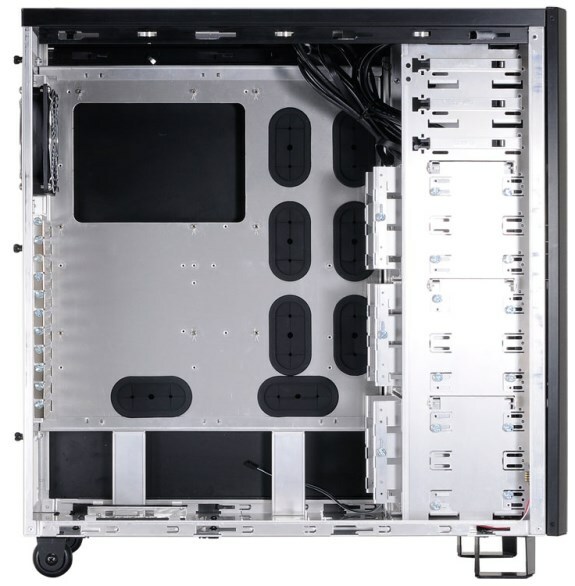 Two rear wheels on the bottom of the PC-A79 allow the chassis to be easily positioned or moved while the front feet add stability when stationary. The I/O panel is located on the top of the PC-A79, and is hidden by a stealth cover when not in use. Connectivity includes four USB 3.0 ports, eSATA, and HD audio connections.